The US-funded Plan Colombia imposed catastrophic violence on the country, resulting in a mountain of corpses and millions of displaced civilians. Some success. With peace within reach in Colombia—on October 2, Colombians will vote on approving a historic treaty that would end the war with the FARC, one of the longest-running insurgences on the planet—politicians and opinion makers in the United States are holding up Plan Colombia as a modular success story, to be cut and pasted into other global hot spots. Hillary Clinton recently recommended that it be replicated in Honduras to fight crime: “I think we need to do more of a Colombian plan for Central America,” she said, when asked by Democracy Now!’s Juan González about her role in legitimizing Honduras’s 2009 coup, telling González to “remember what was going on in Colombia when first my husband and then followed by President Bush” were in office. “Now,” Clinton says, thanks to Plan Colombia, “we’re in the middle of peace talks.” And Shawn Snow, in Foreign Policy, thinks Plan Colombia can be franchised into Plan Afghanistan, to fight Islamist extremists. This is nonsense. Plan Colombia was a bloodbath; as is usually the case, the bipartisan celebration Miroff writes about is taking place on a mountain of corpses and a sea of misery. The billions of dollars provided by Washington basically turned the state, including its intelligence apparatus, over to the paramilitaries. Wrap your head around this number: 6,939,000. That’s the tally of Colombia’s internal refugees, the largest dispossessed population in the world, more than Syria and Iraq, driven off their lands largely by the military in that scorched-earth campaign Miroff mentions, or by settler-paramilitaries who took their property. As to being the most “professional” military in Latin America, between 2002 and 2008—the heyday of Plan Colombia—the Colombian military executed at least 3,000 civilians, mostly poor peasants, then dressed them in rebel olive-green and posthumously armed them. Thus were created what in Colombia is known as “false positives,” which helped the military “boost combat statistics to prove that the government’s campaign against Colombia’s rebels was working.” If Bolivia’s army, or Venezuela’s military—considerably less “professional” and “precise” in Beltway opinion—did anything similar, the outrage in the US media and Congress would be deafening. As it was, you heard barely a peep about this carnage, which was not only funded by the United States, but carried out to justify continued funding. Likewise, when you hear Plan Colombia touted as a success, remember that the problem it sought to eliminate—the post–Cold War resurgence of the FARC, which had grown in military strength and moved into cocaine production—was a problem largely created because the Reagan administration refused to support an earlier peace process. In the late 1980s, thousands of former guerrillas laid down their arms to participate in electoral politics, only to be slaughtered by death squads. Within the FARC, the repression brought to power the most militaristic wing of the rebel movement. Nowhere in all the encomia to Plan Colombia will you hear much about Cuba’s—and especially the ailing Fidel Castro’s and the late Hugo Chávez’s—key role in brokering the peace in Colombia. This was a peace made possible by old and dying men. 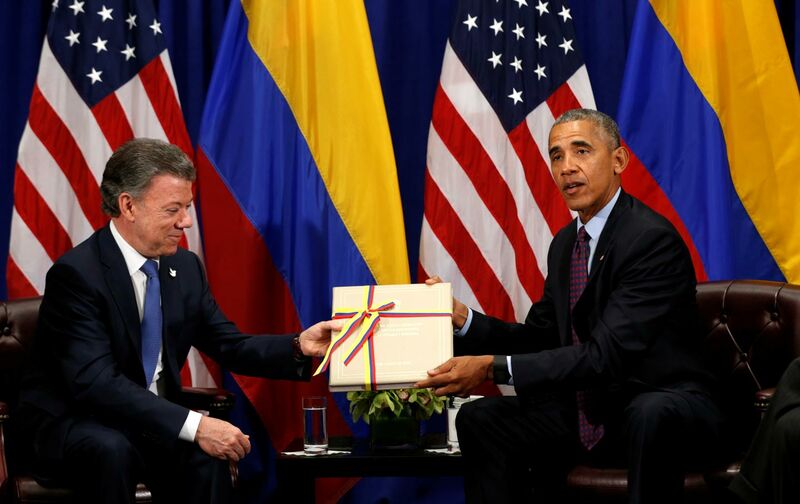 Last week, Barack Obama, in his recent address to the UN, took the credit for Colombia’s hoped-for impending peace, and the Post’s Miroff calls it a “victory for U.S. diplomacy” and a validation of Plan Colombia. But it has been Havana that has been steadfast, not just urging its nominal ideological ally, the FARC, to stay talking when negotiations got rocky, but creating a steady, sane, and, it appears, entirely realistic set of procedural expectations that both sides could agree on (Cuba’s role in helping to broker the agreement is one of the wedge issues the paramilitary right in Colombia, led by former president Álvaro Uribe, is hoping to turn Colombian opinion against the peace in the upcoming referendum). What gets lost in the United States when Plan Colombia is hailed as the predicate of peace is the fact that Colombia’s president, Juan Manuel Santos, negotiated, and made concessions, to the Colombian state’s sworn enemy (here’s a useful report, explaining the extremely complicated truce). In other words, if Washington is really going to replicate Plan Colombia in Afghanistan or Honduras, it would mean bargaining with, and treating as a legitimate force with legitimate grievances, Islamist and gang adversaries, as Santos did with the FARC. The real takeaway from Colombia is that wars can end. That lesson, though, would violate a key premise of our foreign-policy establishment: Our wars are endless.